Warehouse Eight and Kwago started Echoes PH to create a sanctuary for musicians and poets to freely experiment and express what they are feeling at the moment – raw and unfiltered. We invite the artists to tell the stories behind their compositions, and do something different from what they usually do in gigs to an audience willing to embrace the beauty of creative freedom. After setting up intimate gigs at our Warehouse home for a year, we realized that these gatherings has not only been a sanctuary for the artists, but to us who experience it, as it became our regular nightcap where we unplug and connect with people in a more genuine way over booze and music. We feel like we want to share this beautiful experience to more people and build more of these sanctuaries in other places. 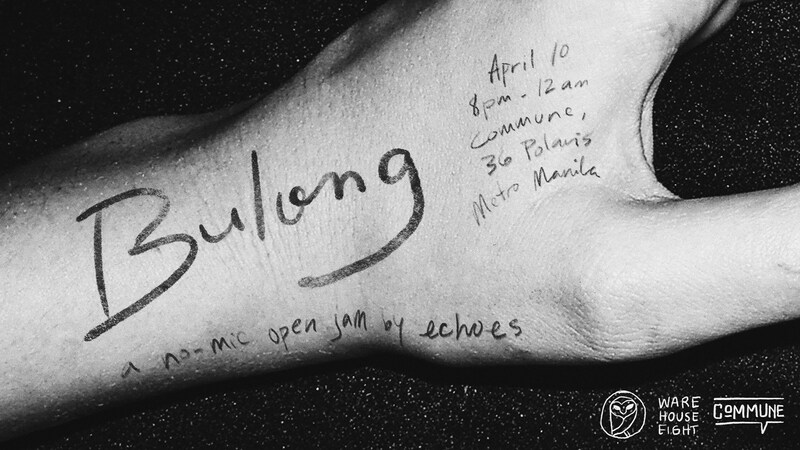 For Commune, we created “Bulong” – a no-mic open jam for poets and musicians to share their secrets to. It’s a whisper-only event (noise level: 20 decibel). Sign language, writing and other forms of non-verbal communication are allowed.